Merrell Australia online now offers a new, simple and flexible payment option for our shoppers - Afterpay. Buy what you want today, pay for it over 4 equal fortnightly instalments, interest-free! Use your debit or credit card, get approved instantly. HOW DO I PAY FOR MY ONLINE ORDER VIA AFTERPAY? When you are making a purchase, simply choose Afterpay as your payment method at checkout. If it’s your first time using Afterpay, you will provide payment details as usual to complete your purchase. Once your first order is approved, your Afterpay account is created. 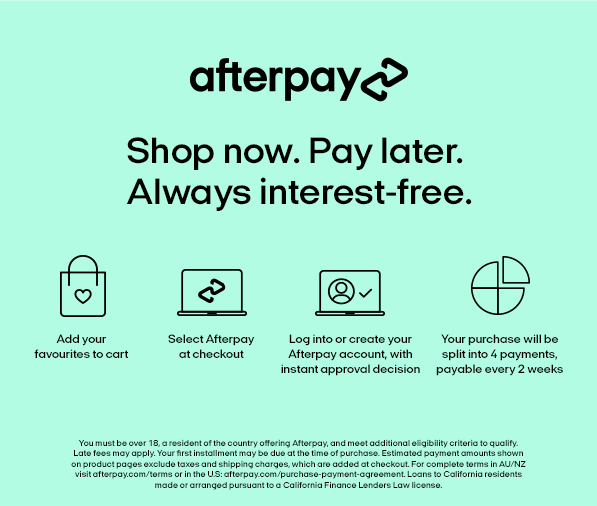 All you need to do is visit www.afterpay.com.au to set up a password, and you will be able to make more purchases using Afterpay by simply entering your log in details upon checkout. Note: Afterpay is available via Merrell online and not instore at this stage. IS THERE A COST TO USE AFTERPAY? Afterpay does not charge a fee to consumers when purchasing and we do not charge interest. The only fees applied to consumers are late fees if your scheduled payments are unsuccessfully processed and, after being notified, you do not log in to your Afterpay account to make your payment via a different method. If a payment has not been made by you on the Afterpay website before the scheduled payment date, we will automatically take payment from your default payment method on that date. The scheduled payment dates can be seen in the confirmation email sent to you after your order was approved, or by logging in to your Afterpay account at www.afterpay.com.au. If an automatic payment fails, you have until midnight (AEDT in the summer months and AEST in the winter months) to make payment. After midnight, if that payment has not been made, you will incur a late payment fee of $10 and a further late fee of $7 if the payment is not made within 7 days (as stated in the Afterpay Terms). We understand that there are certain extenuating circumstances which will not allow you to make payments on or before the scheduled date. If you believe you fall into this category and would like to discuss your payment schedule with us, please email [email protected]. All new Afterpay customers are required to make their first payment at the time of purchase. You will no longer be considered a ‘new’ customer once you have fully paid off your first order AND 6 weeks have passed since you placed that order. For any order thereafter, your first payment will only be deducted 2 weeks after your purchase and your last payment deducted 8 weeks after purchase. Yes, we understand how important security is so we ensure that your personal information is protected. Afterpay is a PCI DSS Level 1 certified compliant Service Provider organisation. PCI DSS is a comprehensive set of requirements created by the Payment Card Industry Security Standards Council to enhance cardholder data security and to ensure the safe handling and storage of sensitive customer credit card information and data. DO YOU OFFER REFUNDS ON ORDERS PAID VIA AFTERPAY? Yes, we accept returns of online orders, providing the refund to you back via your Afterpay account. Please note that any outstanding payment instalments due will be processed until your refund has been completed. Please allow up to 72 hours for your refund to be completed after returning your Merrell – Afterpay order. For information on how to return your online order see our shipping / returns information page. Unfortunately Afterpay does not allow for exchanges. We do however encourage you to return your items and place a new order with us. If you have any questions please call Merrell online customer service on 1800 954 510. Alternatively, for more information contact Afterpay on 1 300 100 729.